Love a bit of juicy gossip, me. See, what happened was--apparently American President William Howard Taft got stuck in the bath. Some say it was on 4 March 1909, on his inauguration day. Others say it happened later in his term. They say it took two men to pry him out--but others say it took four men and a gallon of loblolly (butter mixed with lobster liver) to provide enough slick. Whatever the case, Mac Barnett has certainly had a great deal of fun with this brilliant picture book, speculating on the possibility that this gossip is true. Poor old Mr President, of a rather rotund disposition, gets stuck in the Whitehouse bath. His wife can't get him out, his vice president also fails. The secretaries of state, agriculture, navy, treasury, interior and even war, attempt but fail. How will they ever dislodge this bellowing fellow from his porcelain prison? Chris Van Dusen's illustrations make a funny story ever so much funnier, with absolutely stunning imagery verging on 'cover your eyes quick'. 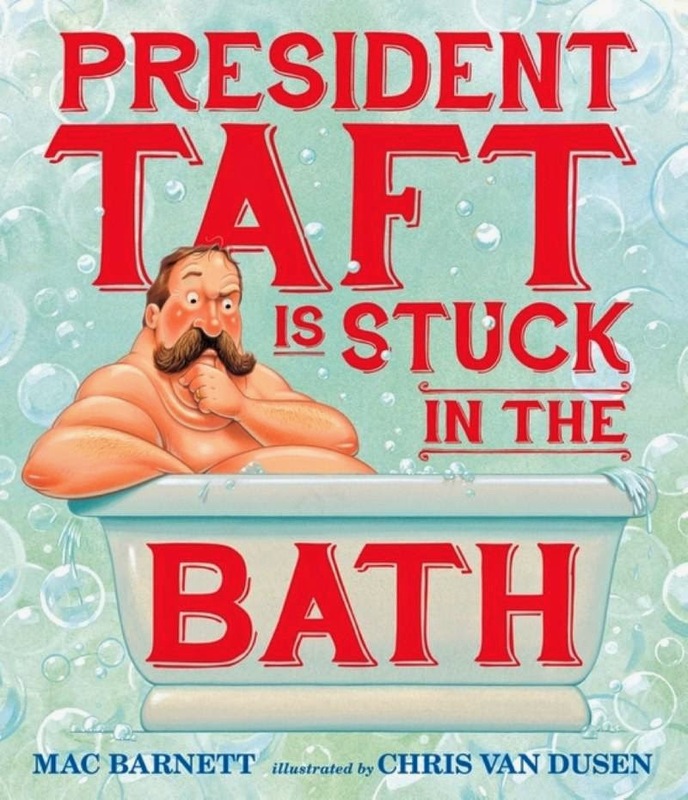 Kids will giggle their heads off over the rolls and folds and acres of pink flesh, billowing out of the bath on every page, not to mention Taft's steam-kettle expressions and hilarious eventual expulsion from the bath, with strategically-placed objects hiding the President's 'shame'. My only complaint would be an excess of text, but otherwise, this romp of a book is a rewarding story and a visual feast kids will adore.